The first flecks of orange sunlight had just begun to peer over the city skyline when the earliest heats began in the Hudson River, starting at 5:50 a.m. The Harlem hills did not pose much of a challenge for Jordan Jones midway through the 6.2-mile running leg of the New York City Triathlon on Sunday. Nor did his right rib cage, still aching after a mountain biking crash less than a month ago. 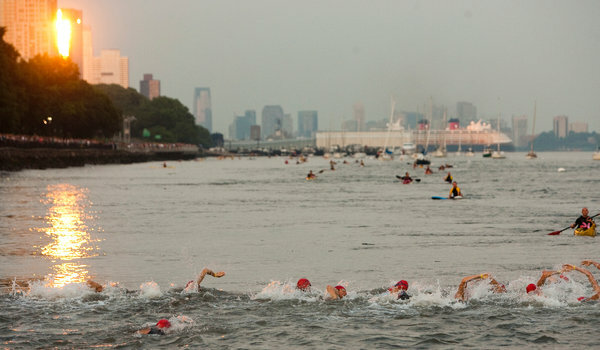 Competitors plunged into the Hudson for the swimming leg of the New York City Triathlon on Sunday. No, for Jones, the race’s winner — and the 3,485 others who finished after him — the main adversary Sunday was in the air. Jones of Golden, Colo., sweated through it, finishing the 12th annual race in 1 hour 45 minutes 4 seconds. Ben Collins of Seattle took second; Kaleb Van Ort of Mishawaka, Ind., was third. On the women’s side, 38-year-old Amy Bevilacqua, a mother of four, edged Elizabeth Blatchford by 20 seconds to win in 2:00:04. The first flecks of orange sunlight had just begun to peer over the city skyline when the earliest swimming heats began in the Hudson River, starting at 5:50 a.m. But the heat — the latest edition of the broiling wave that has oppressed New York and other parts of the country for the past few weeks — was not far behind. After last year’s race, in which two competitors died in the water, apparently after heart attacks, the race owner John Korff added additional measures of security. Before entering the race this year, all participants had to sign a statement indicating that they had completed at least one half-mile of open-water swimming in the last 18 months. Heats were more spaced out — 15 athletes dove in every 20 seconds — as opposed to previous years, when as many as 150 would often enter the water for the 1,500-meter swim at the same time. “That cuts down on the washer-machine effect,” Korff said. And support crews remained vigilant. On the Hudson alone, there were 3 motorboats; 5 water scooters; 30 lifeguards and kayakers; and 10 spotters manning five zones on the eastern bank overlooking the river. But one thing out of Korff’s control was the climate. By 10 a.m., when most of the participants were rounding out their 10-kilometer runs, the temperature was already into the 80s. The water temperature of the river at the start was 74 degrees, and rising. Seven watering stations were spaced along the running route, and the medical tent at the finish was growing busier by the minute. Jones said he consumed two 24-ounce bottles of water during the 40-kilometer (24.8-mile) bike ride alone. The rolling undulations of the West Side Highway were not too challenging for the 29-year-old Jones, a professional triathlete who trains in the foothills of the Rockies. He competed in the New York City Triathlon once before, in 2010, and finished fourth. A month ago, Jones was mountain biking near his home when he slipped and tipped over. His chest landed on his handlebars. Jones thought he had broken half his rib cage. A week later, he was back training. On Sunday, Jones zoomed past Collins, last year’s champion and a graduate of Columbia University, who was eager to repeat on a familiar course. Among the notable first-time triathletes, Laila Ali, a world champion boxer and daughter of Muhammad Ali, finished in 3:06:22. The former Giants receiver Amani Toomer ran as part of the Ronald McDonald Team, which finished in 2:40:59. Bevilacqua finished third last year, but she consistently struggles in the swim. When she emerged from the water Sunday, although second-to-last from her heat, she was encouraged. Transitions are tough — Bevilacqua wears insoles for plantar fasciitis — but she managed to make up time. Winning here, near her hometown, Wilton, Conn., was a big achievement.